Since posting about priming models on Monday, I realized that the title may have been misleading in that I did not actually include the "how" part when it comes to how I prime my models. We'll remedy that here. Going back to the first post, I use spray paint to prime my models. It's one of two colors the majority of the time as well. The other tool I use is my priming board. It's really the lid from an small tupperware bin that I claimed a long time ago. It's just big enough to set a Land Raider on top without falling over. You can use anything really, some folks hold each model in their hand while wearing protective gloves. By using the board, I can batch prime three models at a time. If I do batch prime, the only thing I have to watch out for is getting too much paint on any one particular model. So I generally do one model at a time. This is what the board looks like. I took a minute and measured the distance I hold my spray can at when I prime as well. The average distance is 8 - 10 inches. That's around 20 - 25 cm or so for you guys across the pond if my math is correct. If I back up much further, I'll start to get a fuzzy texture on the surface of the model. Much closer and the paint will pool on the surface and drip. NOTE: I prime year round, the only exception being when it is physically raining. That means in the cold, in the humidity, whatever it may be. I just step outside (with the wind to my back), give the model a quick spray and then bring it back in to dry. I've found that if I shake my can well enough before starting, I don't have any issues. As I make each pass with the paint, I rotate the model slightly. I'd guess around 45 degrees or so for each pass. It depends on how the model is posed and how hard it is to get to all the inside surfaces. How do actually spray paint the model? I have two methods I use when priming. The first is a horizontal pass and the second is a vertical pass. It comes down to how I hold the model. With the horizontal pass, this covers the majority of the model. There are a few things you have to do to get the best results though. 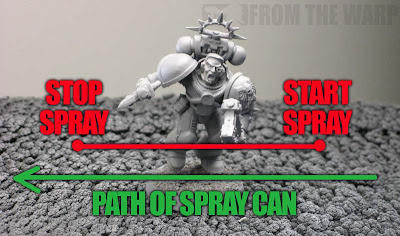 The first thing is to make sure your can is moving AND you start spraying before you pass over the model. The second thing is to make sure you don't stop spraying until you're past the model as well. The horizontal pass is done at True Line of Sight for the model. That means I hold the model up so I am spraying on the same horizontal plane as the model. If you're a bit high or low when doing this, you may accidentally miss some areas depending on how the model is posed. If you look at the picture above, you'd be following the green line as you move your spray can. Once you start moving, you'll want to start actually spraying just before you get to the model and end just after (the red line). You can go left or right when you make your passes, that part doesn't matter. This keeps you from getting too much paint on the model and having it pool. I move fairly quickly in my passes as well. If you go too slow, you run the risk of pooling or obscuring the finer detail. It usually takes me two revolutions of a model to get the whole thing done. Don't try and do it all in one pass. Two lighter coats is far better than one heavy coat that may run or cover details. Once I have my model primed using the horizontal pass method, I tilt it so I'm almost vertical and make a few passes from the top down to get the upper areas I missed. And again, all the same things apply here as well, the distance, the starting and stopping and the lighter coats as opposed to heavy ones. This method gets 99 percent of the model covered. I don't worry too much about the basing as that's usually given a good basecoat anyway later on to help seal in all the tiny elements like sand and rocks. For the areas I do happen to miss, I go back in with some regular paint from a pot and touch up as needed. I find having to go back and touch up is still better than trying to do it all with the spray paint and forcing it to work when it isn't doing the best job. I'd rather spend and extra minute and get good coverage that won't kill my details than to try and force the spray paint into a void space and have it run and pool on the surface of the model. Very helpful post I'm sure! Ah, the good old spray tray! I have a buddy who loves to peel off the dried paint... though it looks like yours is accumulating years of spraying! It's interesting to see how others ACTUALLY spray, because I do certainly do something quite different. I start by laying the model(s) down on their front. This is so I can start spraying the back of the model, aiming from the base, so that the spray gets the underside parts. I then flip the models over onto their front and repeat. Again, getting all of the underside parts. Depending on the intricacy of the model (and how it holds itself up) I will often do this stage in three steps rather than two. Once this stage is done, I then stand the model up and come at the model from probably about 45 degrees. This all usually means that I have got the underside, and topside parts. Though sometimes a quick horizontal dusting helps to ensure nothing is missed. The process is the same for tanks, starting on the underneath, before flipping the thing over. I can't remember the last time I had to hand touch up the prime on a model. Great post, with straightforward directions. One clarification - do you affix the model to the lid, or is it unattached? I ask as you tilt the model, and I'm not skilled enough to keep a model from sliding off. Very useful tips, I actually prime with an airbrush with a .04mm tip, I do it slightly different as i base my models after painting so i usually start with the model upside down and then do the steps you have listed several rotations with light coats. If they have a slotted base a dont use the base at all while priming and use a clothes peg or bulldog clip to hold the model by the strip of plastic or metal. Anon: I just set the model there. I don't affix them as it would make them tough to get off later on and I only wait a few minutes before removing them and spraying new ones. If they were "tacked" in place, I'd end up leaving finger prints on the model in the process of removing it. 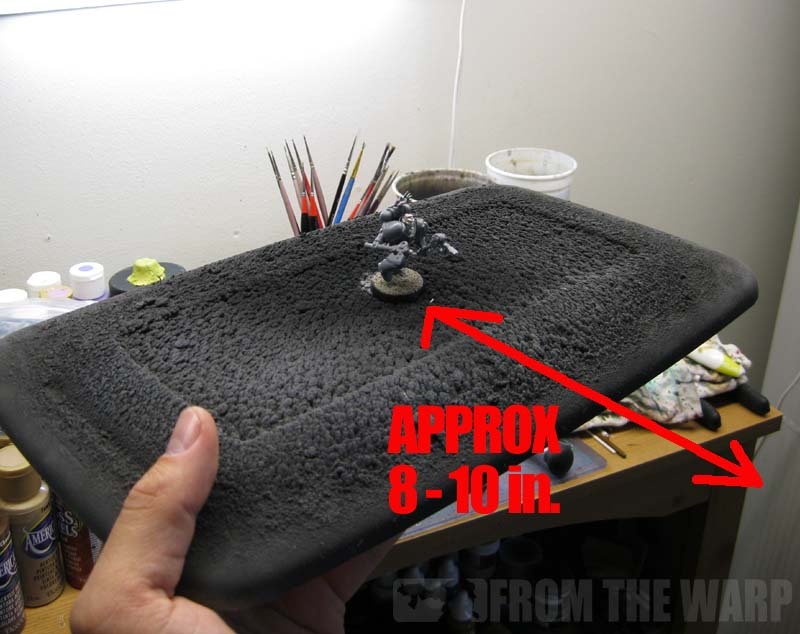 I will have to try this method out, I have typically done much larger batches when I prime. This could be one of my problems. I often prime and paint my back packs separate from the models which can lead to a lot of dropped small plastic bits. To solve this I affix the part to the board with a small amount of a kneadable (or putty) eraser. Enough grip to hold most small parts vertical and I have never had problems removing the eraser. Cool tip, I think my favorite part is actually how 'fuzzy' the box top looks! Really nice post. More than usefull! A question though... were is the metal head from? 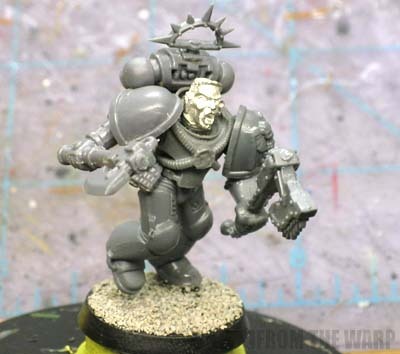 I want to make a Captain Cortez conversion for my Crimon Fists and that head seems perfect! 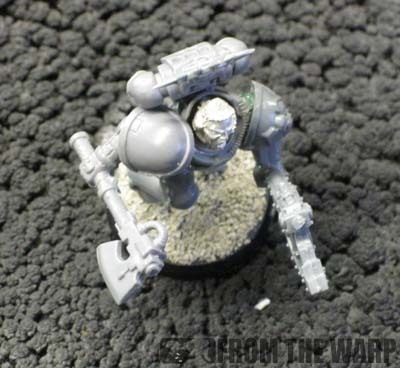 Its from the Kill Team DeathWatch sprue you can get from GW. Lord Azaghul: In addition to being fuzzy, the lid weights quite a bit now. Elhion: I was going to tell you I don't know since the bits came to me to build the model, but it look like Knights Wulfen does. Thanks Wulfen! A very useful guide, and especially for a novice like me. its also worth considering, in humid ares, that the paint coming out can be quite cold, even colder if the can has been sitting in the house. That being said, I also combat humidity in a similar way as you, I prime my models outside, but I let them dry inside...I've tried leaving them out, but they seem to soak up a lot of moisture.